This course is designed to satisfy 2 continuing education credit hours for Contractors and can be taken entirely online. In this course we will equip contractors and business owners in estimating different aspects of your upcoming jobs. I learned a lot more in this class there are so many different things about adding into bidding as well as software available to make a more accurate and faster bid system. Quick to remind you of why you are falling short in estimating. Was very easy to follow. Great Info, I feel confident on making an accurate estimate on future projects. Although I am doing some of what the course mentions, it gives me additional info I can implement. Very good information. Looking forward to implementing parts of it that would improve my estimating and bidding processes. Estimating level 3 was kind of tough! Even as a solo contractor I found this course information very useful. Glad I took this course on Job cost and estimating. Very informative. I received a lot of good information. some of the larger images (examples) overlap the actual chapter information. We miss out on crucial information. Just about the right amount of information. I'll never get those two hours back in my life. The graphic on slide 3 of section 6 blocks the written content. GOOD COURSE. WOULD LIKE MORE VIDEOS AND LESS READING. Worked out fine, but I prefer a video format vs. needing to read the info. We are a small specialty contractor with no employees. A lot of this was geared, it seemed to large companies. However, I did glean information that will be useful in producing our estimates. 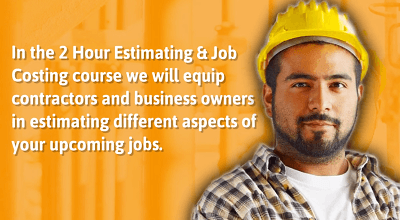 Job Estimating Course can be helpful for any Contractor; lots of the info is more relevant to business owners with employees. The info is wise to follow for estimating and increasing profits. I would prefer a narrator, instead of me reading it all. The course was full of useful information. For the amount of time needed to spend on this course it should count for 3 or 4 hours of CE. Pictures need to be removed. They block a large portion of the written content on pages where they appear. no way I could finish this course in 2 hours. The course was very repetitive with signs of copy and pasting previous course material. No professional in this industry uses many of the terms and descriptive verbiage used in this course to describe types of estimates such as "SWAG" or "WAG (Wild A#$ Guess)" Those are terms on the internet that are not professionally used nor acceptable. This was the most boring class I've ever taken.